A glass can be viewed as a liquid in which a huge slowing down of the diffusive motion of the particles has destroyed its ability to flow on experimental timescales. The slowing down is expressed through the relaxation time, that processes relax to equilibrium. Cooling down from the liquid phase, the slow degrees of freedom of the glass-former are no longer accessible and the viscosity of the undercooled melt grows several orders of magnitude in a relatively small temperature interval. As a result, in the cooling process, from some point on, the time effectively spentat a certain temperature is not enough to attain equilibrium: the system is said to have fallen out of equilibrium. The preparation, indeed, plays a fundamental role to get a glass out of a liquid, thus avoiding the crystallization of the substance. Depending on the material, the ways of obtaining a glass are very diverse and consist not only in the cooling of a liquid but also include compression, intense grinding or irradiation of crystals with heavy particles, decompression of crystals that are stable at high pressure, chemical reactions, polymerization, evaporation of solvents, drying, deposition of chemical vapors, etc.. Many kinds of materials present a glass phase at a given external condition if prepared in the proper way: for instance silica, halide and chalkline based glasses, carbon-based polymer glasses like polyvinylchloride (PVC), germanate dioxide, orthoterphenyl (OTP), open network liquids.....The list is immense and for an exhaustive literature the reader can refer to the books of Donth (2001), de Jong (2002), Rao (2002), Mysen & Richet (2005), Ngai (2011), just to mentiona few. are separated by high energy barriers. Apart from rare, often explicitly constructed exceptions, the crystal state is always at lower energy, but the probability of germinating a crystal instead of a glass during the vitrification process is negligible when cooling fast enough: the nucleation of the crystal phase is practically inhibited. In a nucleation event a small but critical number of unit cells of the stable crystal state combine on a given characteristic timescale, the nucleation time nuc. In a good glass former, the number of molecules involved in the nucleation must be much larger than the number of molecules cooperating in the structural relaxation of the glass phase (composing what is called a cooperative rearranging region - CRR), yielding, in this way, a nucleation time much longer than the structural relaxation time. A large nucleation time means that the probability that a fluctuation takes place, allowing a critical number of unit cells to form a crystal, is low. In certain (computer) binary solutions [Kob & Andersen, 1994, 1995a,b; Hansen & Yip, 1995; Parisi, 1997b], at low temperature, the amorphous state is even thermodynamically preferred to any crystalline structure! The same appears to occur for the atactic vinyl polymers, whose lowest energy conformations cannot pack in a regular structure [Gibbs & Di Marzio, 1958]. Many processes are involved at the glass transition, or better, around it, since the transition region depends on the way it is reached in an experiment, and the timescales of the processes play an essential role for the properties and the behavior of the glass former. 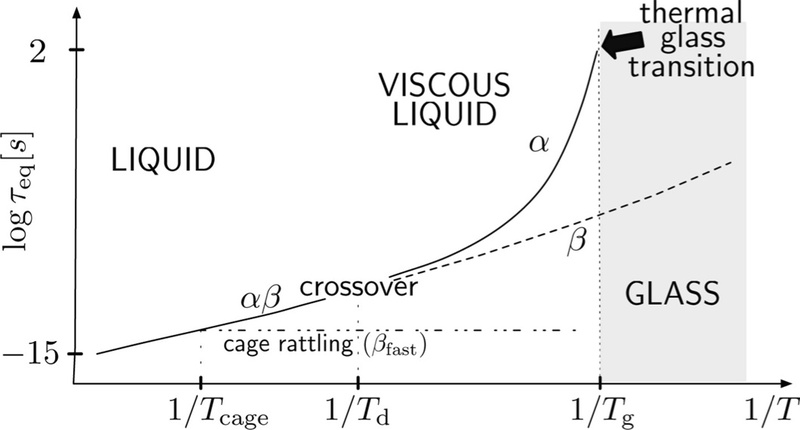 time needed to have one long distance diffusion process of a particle while it is rattling with a high frequency among its neighbor particles forming a (dynamic) cage around it. presence of a separation of timescales, that becomes more and more enhanced as temperature is lowered.